Heads-up poker is a whole new ball game. As there are only two players, ranges are dramatically wider in every situation. Quickly and efficiently adjusting your strategy to counter your opponent is crucial in heads-up no limit, moreso than any other game. If you use easily exploitable strategies at the wrong time, you will often find yourself bleeding away buy-in after buy-in. WCGRider vs Sauce challenge after 2 sessions (2013). In this article, I’ll explain how to approach the most common decision in heads-up: opening from the button. The button also posts the small blind. The button acts first pre-flop and last post-flop. All of these incentivize you to play a very wide range of hands (70%+) from the button. So, what specific hands should you play? And how should you play them? You can’t win the pot by limping. Limping gives the big blind the opportunity to check and see a free flop with 100% of their range. This allows them to realize more equity with all of their hands, including some that would have folded to a raise. Limping makes the big blind’s life easy. Unlike limping, raising forces the big blind to play larger pots with a positional disadvantage. A very compromising position. From a theoretical perspective, it is important to have a well-balanced strategy that is tough to exploit. If you limp with only weak hands that want to see a cheap flop, the big blind can exploit you by turning up the aggression in limped pots (both pre-flop and post-flop). …but there’s a glaring problem with this solution. You’re now taking some of your strongest hands- the ones you want to play huge pots with- and you’re limping with them. Do you really want to play a 2BB pot when you have AK? I sure hope not. Using a well-balanced limping strategy does have an upside. It allows you to see a cheap flop with some weak hands that you would otherwise fold. But that’s a drop in the bucket compared to the downside of losing value with some of your biggest hands. Now that I’ve lectured you on the dangers of limping, let’s talk open sizing. Heads-up no limit is a reactionary game, so it should be no surprise to learn that the optimal open-raise size depends on how the big blind plays. Specifically, how often do they fold to steal and how often do they 3-bet. The first stat to look at when playing heads-up is your opponent’s fold to steal percentage. If the big blind frequently folds to your steals, use a small open-raise size (2x-2.25x). Small sizes give you a better price to steal the pot, which allows you to open a wider range of hands and really take advantage of the big blind’s weak play. If the big blind frequently defends against your steals, use a larger open-raise size (2.5x-3x) and tighten your range. This forces the big blind into larger pots against a stronger range while out of position. Not a favorable situation to say the least. 3-betting is the only way the big blind can force the button off of it’s equity pre-flop, which is why 3-bet percentage is a crucial factor to consider when sizing opens in heads-up no limit. Versus an aggressive 3-betting strategy, tighten up your opening ranges so you will be able to defend a larger portion of your range against 3-bets. Opening too many hands that can’t continue against a 3-bet is a sure fire way to spew chips in heads-up no limit. Conversely, you can open a wide range of hands against a player with a conservative 3-betting strategy because they are unlikely to blow you off of your equity. In heads-up no limit, every single time you fold your opponent wins the pot. This is why you must be willing to play a much wider range of hands than you would in any other game type. 91% of hands is a reasonable button min-raise range against tight opponents. If you are opening to a larger size (3x) versus a loose opponent, it is usually best to open somewhere between 70% and 80% of hands. As you may have noticed, even a ‘tight’ heads-up opening range is wide compared to the typical 6-max button opening range (usually around 50%). Try not to be afraid of playing such a wide range of hands, even if you aren’t used to it yet. After all, heads-up is all about fighting for every pot possible. If that makes you uncomfortable, maybe try a different game. When determining your button strategy in heads-up no limit, the most important factor to consider will be the big blind’s tendencies. Of course, sometimes you won’t have any information on the big blind. When that’s the case, I default to a 2.5x open size with about 85% of hands. As the match progresses, I tweak that default strategy to counter the tendencies of my opponent. Craving more heads-up info? 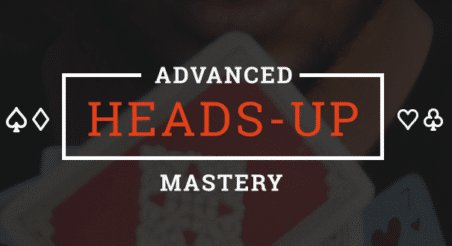 Learn how to put the button to the test with How to 3-Bet in Heads-Up No Limit. Overbetting, check/raising and donk bets, oh my! Learn about them all in 3 Poker Concepts Every Aspiring Pro Needs to Know.